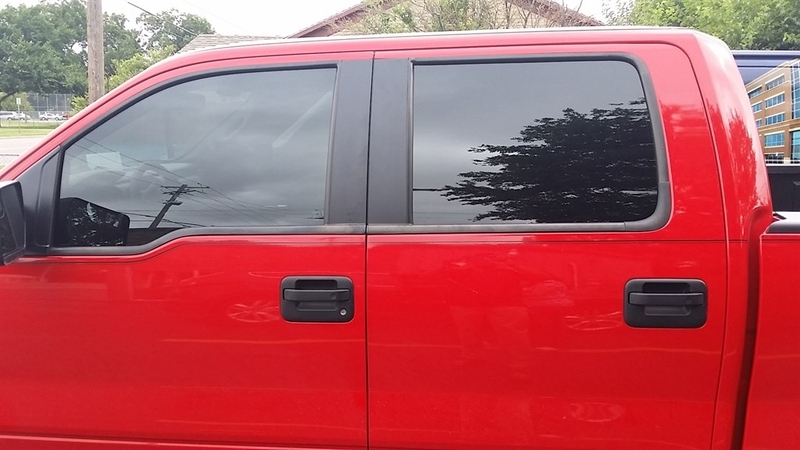 To tint car windows, you need window-tint film, window-tint film application solution, a lint-free cleaning cloth, a razor knife, a scraper blade, tape, a heat gun and an application squeegee. You also need a dust-free area to work, and the weather must not be excessively hot, cold or humid. Spray application solution on the inside of the window to be tinted, making sure to avoid over-spraying onto the door trim. Run the scraper across the window from side to side, working down the window and being careful to avoid gouging it. Do the same with the squeegee. This should remove all dust, grime and debris. Spray application solution to the outside of the window, and roll the film over the window, protective side up. Run the squeegee over the film to hold it in place while you cut. For sliding windows, roll the window down 1/4 inch, and use the top as your template, rounding any edges with your finger as a guide. Slide the film up half an inch, then cut the bottom using the rubber window gasket at the base of the window as a guide. For non-sliding windows, use the window gasket as a guide, and cut right up to the edge. Secure the film to a corner of the window with clear tape, and remove the protective liner. Spray the tint film with application solution as you remove the liner. Once the film is entirely free of the liner, discard the liner, and remove the tint from the outside of the window. Apply the tint to the inside of the window, folding the bottom up onto itself to prevent it from touching the door trim and leaving a 1/8-inch gap from the top of any sliding window. Run the squeegee over the film at the top to push out any air or excess solution. Roll up the window, and spray the bottom of the film with more application solution. Use the squeegee to hold the gasket while you push the film beneath it. Use the squeegee to get out any air or excess solution at the bottom of the film. Wrap the squeegee in a lint-free cloth, and run it over the entire window to remove excess application solution. Use the cloth to wipe down door trim and paint. If there are any bubbles of air or solution left beneath the film, use a heat gun to gently heat the area and squeegee the bubbles out towards the nearest window edge. Server responsed at: 04/18/2019 11:17 p.m.